The tensions in Crimea have already had serious economic consequences for Russia. 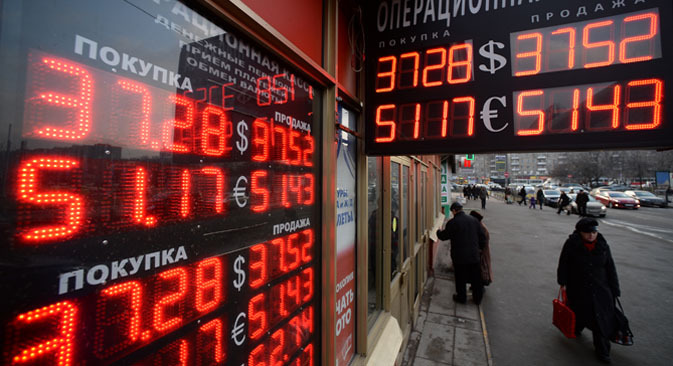 The country’s stock market fell dramatically on Monday and the ruble continued its slide. The ruling on Saturday by Russia’s Federation Council to authorize use of force in Ukraine has already had significant repercussions for international markets. On Monday morning, the Frankfurt DAX fell by 2.5 percent and Tokyo’s Nikkei, by 1.27 percent. In the U.S., the Dow Jones Industrial Average was down nearly 1 percent. But of course the biggest effect was felt in Moscow, where by 4:30 pm local time, the MICEX index plunged by 12.5 percent and the RTS, by 14 percent. Trading on the foreign exchange market began with further blows to the value of the ruble. For the first time ever, the euro has risen above 50 rubles, while the official dollar-to-ruble exchange rate set by the Central Bank of Russia on Mar. 4, 2014 reached 36.38 rubles to the dollar. The last time the ruble/dollar rate exceeded 36.3 was on Feb. 7, 2009. One of the first countermeasures adopted by the Russian Central Bank was a "temporary" increase of the Central Bank rate from 5.5 to 7 percent, aimed to "prevent inflation and financial stability risks," according to a statement from the bank. Konstantin Bushuyev, head of the market analysis division at the Otkrytiye brokerage firm explained that the move "locks the market from a collapse, from a rise in capital flight." It is difficult to say how long the Central Bank's "shield" will be able to contain the markets, however. Many experts compare the current developments to the events of August 2008, when Russia began a military operation in Georgia's breakaway region of South Ossetia. On the morning after Russian troops entered Georgia, the MICEX dropped by more than 5 percent and the RTS, by 6.5 percent. Anatoly Tsyganok, head of the Center for Military Forecasting, said that the cost of a military action in Crimea would be comparable to the cost of the five-day conflict with Georgia, which took place Aug. 8-12, 2008. According to calculations made by the Strategy and Technology Analysis Center, peace in South Ossetia cost Russia 12.5 billion rubles (about $400 million at the exchange rate at the time). However, analysts stress that these comparisons are relevant only if there is a full-scale military operation in Crimea, which is unlikely. In addition to military costs, Moscow is prepared to allocate financial aid to Crimea, which is experiencing a shortage of funds to pay pensions and salaries to public sector employees. Another factor that is causing concern among investors are threats of economic sanctions against Russia from the United States and the EU. Although no definitive measures have been taken, statements from Western leaders mentioned economic sanctions as one step that could be taken. However, many European leaders are being cautious in their rhetoric – while trade between the U.S. and Russia is minimal, Russia is the EU’s third-biggest export partner. Many Europeans are already concerned about the effect the current crisis might have on the gas supplies that flow to Europe through Ukraine.